It’s no secret that Terry Pratchett is my favorite author since the day Evelyn Brown lent me a copy of Soul Music by Terry Pratchett in 1998– in Mr. Ross’s AP Calculus class, no less. This led me to a book– Good Omens, written by Sir Terry Pratchett with an author I’d never heard of. That unknown-to-me author was Neil Gaiman, and though Mr. Pratchett has a very dear place in my heart, Mr. Gaiman is quite simply, followable. He’s active on twitter, facebook, tumblr, and his blog. He’s in the public often, alone and with his fabulously named wife Amanda Palmer. He’s on Ted Talks, YouTube, and in the news. Even if we aren’t the sort to go completely fangurl over a celebrity, he’s the sort of celebrity that seems to invite the attention. It’s as if he’s decided he’ll be a celebrity, and he’ll encourage the masses to be creative, wise, and kind. Some time ago, I found myself feeling quite disappointed in my job. I thought I was trading my previous career as an accountant who was definitely under-compensated and over-worked for a new career as an auditor where I would be appropriately challenged and compensated. Unlike every reasonable person in the world, I did not look at my job title of “auditor” and think to myself, “How utterly boring!” I looked at my job and thought, “This sounds perfect– always something new and exciting and with complicated maths!” My excitement and glee was quickly shut down, then clamped down, nailed shut, submerged in wet concrete, seasoned, sacrificed, and drowned in a terrible and deep sea. I have two words for you: Data Entry. Auditors do tons of data entry. Resentment grew, and I found fault with everyone and everything at work. And then, New Year’s came, and I found something I had forgotten: Mr. Gaiman’s New Year’s wishes. And, most importantly (because I think there should be more kindness and more wisdom in the world right now), that you will, when you need to be, be wise, and that you will always be kind. I realized that I had not been wise, and I certainly wasn’t being kind to myself or to anyone else. So, I began reminding myself that I should always be kind, but if I must, I could be wise instead. I find it very difficult to do two things at once, so I figured that the universe would understand if I found it impossible to be both kind and wise. I began interrupting my monologues tirades with a simple explanation to whomever I had been speaking, “Sorry– I don’t have anything kind to say, and it would probably be wise if I just stopped talking.” This self-interruption continued for months, and it even got a few laughs. My friends even started asking me if I was being kind or wise when I put my opinion on display for the world. And yet, even with my decision to be kind at the very least, and if not kind, then wise, I did not enjoy my job anymore than when I found fault at every turn. I found my answer and a profound sense of peace in the famous words of Sir Terry Pratchett’s dwarf-raised human watchman Carrot, “Personal isn’t the same as important.” Personally, I’d like my job to be the way I envisioned it, but the important part is that I am gainfully employed, treated well, and competent. I envisioned my life as a Venn Diagram, pictured below, and suddenly, it all made sense. The thing that was missing from my was not an intersect between the Work circle and the Things That I Enjoy circle– the Writing circle was completely absent from my life. I wasn’t writing and hadn’t written anything in ages. 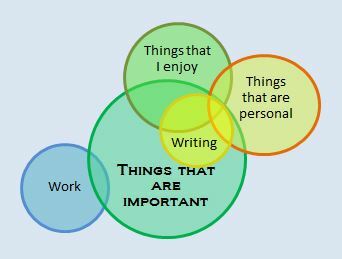 Since my Venn Diagram epiphany, the writing circle is present in my life, and I have found that I am able to concentrate better at work. I get bored less easily, and I have even discovered ways to enjoy what I am working on. It’s as if the universe knew, way back in 1998, that I would need the influence of Sir Terry Pratchett and Mr. Gaiman to get through my job in 2013 and find a sense of peace in 2014. And a big thank you to Ms. Evelyn Brown with your long, thick blonde hair and fantastic taste in literature, wherever you are! This entry was posted in All, Musings and tagged Neil Gaiman, Venn Diagram. Bookmark the permalink.